The Khalif General of the Tijanniya brotherhood in Tivaoune, Senegal has passed away Wednesday, according to Senegalese media reports. 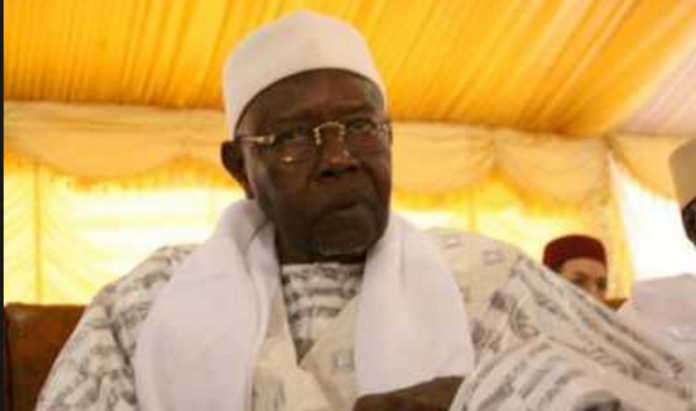 Serigne Cheikh Ahmed Tidiane Sy commonly known as “Al-Mahktoum” died at the age of 91. He is the 5th Khalifa to El-Hadji Malick Sy (RTA) (1855-1922) his grandfather in Tivaoune. The late Serigne Cheikh Ahmed Tidiane Sy became Khalif General of the Tidianes, following the demise of his brother Serigne Mansour Sy Borom Daradji (1925-2012) in 2012. After completing his mastery of Quranic sciences with Serigne Saybatou Fall and Serigne Alioune Guèye, together with his late elder brother Serigne Mansour Sy, Serigne Cheikh Tidiane Sy made a passage in the hands of his paternal uncle El-Hadji Abdul Aziz Sy, who taught him , notably, diction lessons. Son of Serigne Babacar Sy, the late Serigne Cheikh Tidiane Sy completed the lower and middle cycles of Islamic studies at the age of 14. At 16, he published his first book: “Les vices des marabouts”. Later, he wrote “The Unknown of the Senegalese Nation: El-Hadji Malick Sy”. In his thirties, he made his first trip to Paris, where he lived, much later for five years. He was appointed as Senegalese Ambassador to Egypt in 1960 by former Senegalese president Leopold Sedar Senghore. One of his eldest sons Serigne Moustapha Sy is the proprietor of the Senegalese privately owned television called Mourchid Tv in Dakar.